Also called "small-flowered", Epilobium parviflorum is a member of the Onagraceae, the same family to which Evening Primrose belongs. The genus is rich with many species that have extensive references in the literature, especially from the Eclectics, but this species seems to be a little less well-known. I've been dancing back and forth with this plant for a few years: first, pulling it as a weed. Then, appreciating its flavor on hot summer days. Drinking its tea. Preparing a tincture. Introducing it to some clients. It really is a helpful herb, though unassuming (funny how often these two qualities go hand in hand); and since Rebecca is hosting a blog party on less common botanicals, this one fit the bill, at least for me. Its Latin name means "a small flower on the end of a tube", and that describes the inflorescence well (serving also as something of a signature, if you ask me). 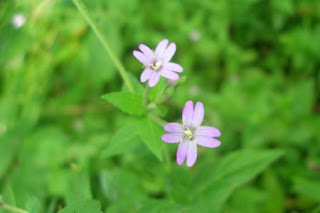 The flower itself is beautiful, small and delicate, with four deeply notched purple petals, revealing itself a bit later in the season (late June / early July) up here in Vermont. Later, in August, the long ovaries open to reveal seeds that float off on fine down, much more delicate than that of milkweed but similar in behavior. It spreads quite easily, but behaves well: its root is divided, and easy to pull if you're so inclined. I've been using the leaves for medicine, and my feeling is that they are most potent right now, before the flower heads start forming. They are opposite, a finely toothed and almost glossy, with deep veins and a slightly maroon color at the base, where they clasp the stem tightly. As the plant ages, the leaves spread out a little bit, and become smaller as they grow up the stem. Straight off the plant, the leaves taste sour and are a bit astringent, but have a roundness and "butteriness" that balances out the tannins well. As an infusion, the flavor becomes a bit more complex and bitter, but retains the round fullness I've come to associate with more aromatic plants. Hmm. The tincture of the fresh leaves, prepared at about 60% alcohol b/v, is less astringent than the infusion and more bitter. I've come to favor it for medicinal use, as I believe the sterols it contains are better extracted by this method. The whole plant contains polyphenolic compounds in the broad family of tannins, related somewhat to the catechins found in tea or the more widely distributed flavonoid polyphenols. Specifically, a compound called oenothein has been identified and linked to some of its medicinal action (at least, on enzyme models in a petri dish). Additionally, plant sterols (such as beta-sitosterol specifically) are present in appreciable quantities. Part of its "round" flavor may also be related to the good amount of mucilage it contains. Historically, the whole genus is used for gastrointestinal complaints, mostly characterized by bloating and inflammation (I definitely consider this a cooling herb). Colitis and "irritable bowel" might be good modern names for what goes on in a gut that could benefit from the willow-herbs: too fast, too sour, crampy and stressed. Generally, a loose stool (though I suppose it would help in either loose or dry stools if the constitutional profile fit). Modern research seems to agree that Epilobium would make a great medicine for mice with stressed out intestines. I can see how a gently astringent, mucilage-rich plant would help slow the GI tract down a bit, thereby improving digestion and absorption. To this end, a tea would be best (you're not really after the sterols), combined perhaps with agrimony or chamomile. But Epilobium parviflorum specifically, due to its rich phytosterol content as well as the oenothein, has found a place in my apothecary for helping men who are having prostate problems: swelling of this gland results in obstructed urine flow, which causes much discomfort and a dribbly, unsatisfying urine stream. The research on oenothein seems to suggest that this compound has an effect of the enzyme 5-alpha-reductase, responsible for converting testosterone to DHT (dehydrotestosterone, a reduced form of the hormone) which has pretty conclusively been implicated in prostatic inflammation. Additional research shows that the whole plant has broad-spectrum anti-inflammatory effect, which certainly helps. I suspect that its name may have come from this ability to control swelling and inflammation, much like the willow tree does. Regardless, I combine it to good effect with cleavers and yarrow for treating prostatic inflammation and hypertrophy - and I'm excited to move away from using the non-bioregional saw palmetto for this purpose! It seems to work better, anyway. General info on other Epilobiums from Maude. Research on non-proliferative effect of various Epilobiums. 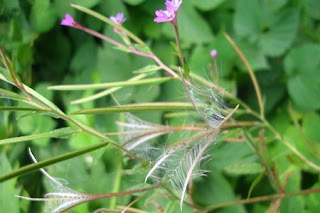 Some say Epilobium species have antifungal effects, systemically and topically.